A recent NPR piece revealed that Marble Collegiate Church was Donald Trump’s spiritual home. The piece also described the influence one of the church’s famous pastors, Norman Vincent Peale, the author of The Power of Positive Thinking, had on Trump's thinking ("How Positive Thinking, Prosperity Gospel Define Donald Trump’s Prosperity Outlook,” NPR, 8/3/16) The NPR story goes on to quote Michael Hamilton, a historian of American Christianity at Seattle Pacific University thusly, "Peale got very interested in the notion that the Gospel could unleash power, that having a divine relationship with God could unleash power within a person for success. And he defined success pretty broadly, so it partly included material success. God didn't want people to be poor." One might note that this is a little different from the description of Protestantism offered by Max Weber in The Protestant Ethic and the Spirit of Capitalism where the importance of values like hard work and frugality lay in the fact their possessor had received God’s grace. The Peale notion is a little more raw and relates to the juggernaut of willfulness that’s characteristic of salesmanship and success while that espoused by classical Protestantism emphasizes the spiritual side of things. When Trump commented about his campaign after a fractious week when his own Vice President broke ranks to endorse the House Speaker Paul Ryan that “It’s never been so well united” (“Trump Says campaign ‘never been so well united,'" LA Times, 8/3/16), he was exhibiting the power or shall we say the delusion of positive thinking. Salesmen rarely tell the truth. Their product is always great. You have to buy it. A good salesman could sell you manure or the wall that Trump is not only going to build but make Mexico pay for. 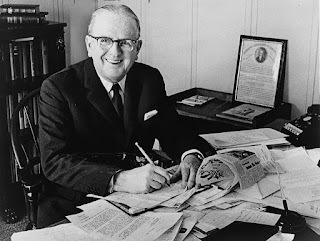 One wonders what Norman Vincent Peale or his student Donald Trump, would think about Arthur Miller’s Death of a Salesman, one of the masterpieces of modern American literature, that deals with a tragic character who can’t talk himself out of his fate and who buckles under the weight of circumstances.